'S e eilean Spàinnteach agus aon de na h-Eileanan Canàrach a tha ann an Gran Canaria. Tha e suidhichte anns a’ Chuan Siar mu 210 cileameatair air falbh bhon àird an iar-thuath oirthir Afraga. Tha Tenerife agus Fuerteventura faisg air. Tha Gran Canaria air meud de 1,560 cilemeatair ceàrnagach. 'S e Pico de Las Nieves (1,949 m) a' bheinn as àird air an eilean. Anns a’ bhliadhna 2007 bha 815.379 de shluagh ann. Tha Las Palmas de Gran Canaria na phrìomh-bhaile. Tha roinn turasachd gu math làidir ann an Gran Canaria. Mar is trice bidh an teothachd eadar 18° is 26° tron bhliadhna. Bidh mu 2,2 millean luchd turais a' tadhail air an eilean gach bhliadhna, gu h-àraid san gheamhradh. Leis na tràighean brèagha is farsaing 's e teis-mheadhan turasachd a tha anns na bailtean Maspalomas, Playa del Inglés agus San Agustín. 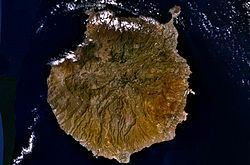 Air a tharraing à "https://gd.wikipedia.org/w/index.php?title=Gran_Canaria&oldid=510068"
Chaidh an duilleag seo a dheasachadh 3 dhen Fhaoilleach 2016 aig 12:15 turas mu dheireadh.